Early 2014, five trend watchers teamed up to share their views on the consumer and societal evolutions for 2014 and beyond. 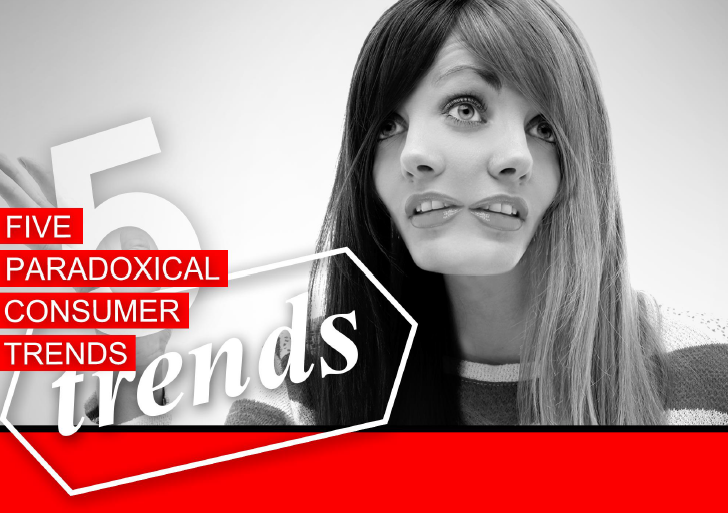 In a brand-new consumer trends paper, we gathered 5 paradoxical trends defining the consumer of today and of the future. Listen to Joeri Van den Bergh introducing his consumer trend ‘Serendipity‘. Learn from Joeri Van den Bergh how global brands such as Heineken and Renault are using serendipity in their advertising. Find out from Steven Van Belleghem how companies benefit from the abundance of useful information to predict consumer behavior. Discover with Sven Mastbooms how existing business models are under pressure due to the consumers’ urge to take a quicker, easier and cheaper shortcut to the solution. And finally tune in to Herman Konings to find out how consumers are taking control of their own health.